Peter Griffin comments on Big Z's "apology"
Fake apology. Read it here. Fake apology to cover up his stupid turbo retirement, which could cost him ONE MILLION DOLLARS... times 19. Fake apology because he thinks Cubs fans (like myself) are stupid. We were, for ever liking this nut case. It was like trusting Lex Luthor, although, deep down, you knew he would sooner or later double cross you. A lying snake like that couldn't resist the chance. Walter Matthau thinks Big Z should pull his lower lip over the top of his head and swallow. 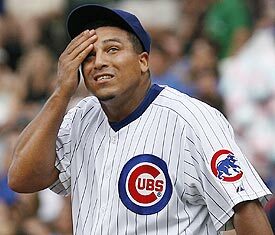 He wants to stay on the Cubs. Ladies and Gentleman, Mr. Peter Griffin.